I am an aquatic community ecologist, and my research program focuses on using invasive species to answer ecological and evolutionary questions. Nonindigenous species can alter ecosystems and threaten global biodiversity, so understanding the conditions that promote invasion success and control the impacts of invaders is important for management of today’s ecosystems. Further, the addition of species to novel communities and environments provides natural experiments that are powerful tools for investigating questions in ecology and evolution. I am particularly interested in how evolution over short timescales alters the traits of species and their ecological impacts. I also study interactions between native and invasive species, especially interactions between parasites and their hosts. I am currently a postdoctoral researcher in the Institute for Great Lakes Research at Central Michigan University. I obtained my PhD from the University of Notre Dame under the direction of David Lodge, and my M.S. from the University of Georgia under the direction of Alan Covich and Stephen Golladay. For my master’s research, I examined the role of temperature selection in determining the distribution of indigenous and nonindigenous crayfishes in southeastern rivers. The nonindigenous species I focused on, Orconectes palmeri, was common the Flint River, but we did not detect it in connected, spring-fed tributaries. In a laboratory temperature gradient experiment, this species consistently selected warmer temperatures than native crayfish, suggesting that cooler tributaries may provide a refuge for native species (Sargent et al. 2011, Biological Invasions). I also examined interactions between these crayfish and predatory fish by surveying largemouth bass and flathead catfish stomach contents in locations with varying abundances of different crayfish species. These results suggested that predatory fish were not preferentially selecting either indigenous or nonindigenous crayfishes. Biological invasions have enhanced our understanding of the rate at which species evolve and the ecological consequences of evolution that occurs rapidly, on ecological timescales. Nonindigenous species can rapidly adapt to conditions within the introduced range, which may alter their impacts. In addition, cumulative evidence indicates that dominant nonindigenous species typically have stronger impacts on lower trophic levels than dominant native species, likely because they do not share a long coevolutionary history with native organisms. Therefore, understanding the effects of evolution on both short and long timescales is key to predicting the impacts of nonindigenous species. I am interested in how the invasion process shapes the traits of species. For example, because conspecific densities are low during the initial stages of an introduction, invasive populations may experience greater selection for particular life history traits such as early maturity and high fecundity. In addition to growth, I also examined behavior of native and invasive rusty crayfish after they were raised in a common environment. Rusty crayfish from invaded range populations were more active than those from the native range when predators were absent, but all crayfish were inactive in the presence of predatory fish (Reisinger et al. 2016, Biological Invasions). These data suggest the behavioral response of rusty crayfish to predators is plastic, but activity level in the absence of predators has diverged since rusty crayfish were introduced. The next steps in this research are to test whether this phenomenon is common across different invasive populations and the extent to which it alters nonindigenous species impacts. As part of my postdoctoral research, I am testing whether divergence in invasive populations is strong enough to alter competitive interactions between crayfish species. In addition to looking at divergence in native and invasive rusty crayfish populations, I am also examining whether native and invasive virile crayfish populations have diverged. Interactions between rusty and virile crayfish have been well-documented in northern Wisconsin. In this region, invasive rusty crayfish often extirpate native virile crayfish from lakes by outcompeting this species for food and shelter. Despite this pattern in the introduced range of rusty crayfish, in the native range of rusty crayfish (Indiana), virile crayfish have been introduced and are present at sites also occupied by native rusty crayfish. I hypothesize that competitive and/or antipredator behaviors have changed (due to evolution or behavioral plasticity) as each of these species was introduced, allowing rusty and virile crayfish to coexist in Indiana, but not in Wisconsin. I am currently testing this hypothesis in collaboration with Lauren Pintor and her student, Mael Glon, from Ohio State University. Understanding host-parasite interactions is essential for understanding biological invasions because leading hypotheses in invasion biology (Enemy Release and Evolution of Increased Competitive Ability) hinge on negative impacts of parasites on hosts. Further, the influence of parasites and pathogens on ecological communities is an emerging topic in ecology, and evidence suggests that parasites can often be important. For example, recent research indicates that parasites can make up a substantial portion of the biomass in an ecosystem and can increase food web connectivity. During an invasion, a host may be introduced without its parasites or parasites may switch to use a novel host; therefore, biological invasions provide unique opportunities to examine the ecological effects of parasites and how coevolution influences host-parasite interactions. In my PhD, I focused on the impacts of parasites on host abundance and behavior. I tested the relationship between trematode parasite (Microphallus sp.) prevalence in invasive rusty crayfish and crayfish population trends through a multi-year survey in Wisconsin lakes. Microphallus prevalence was associated with declines in rusty crayfish population growth, and because crayfish are predators of hydrobiid snails (the first intermediate host of Microphallus), parasites may enhance alternate states in crayfish abundance that were previously attributed only to predators (Sargent et al. 2014, Oecologia). I also examined the behavioral effects of Microphallus on crayfish feeding, aggression, shelter use, and predator avoidance. I found that infection substantially altered crayfish behavior, and had differential effects on indigenous and nonindigenous crayfish congeners (Reisinger et al. 2015, Freshwater Biology). These behavioral changes are likely to make crayfish more vulnerable to predation. This parasite is trophically-transmitted; thus, these changes in host behavior may be an adaptation of the parasite to increase transmission to higher trophic levels. Finally, I studied how these parasite-induced behavioral changes impact the benthic aquatic community. 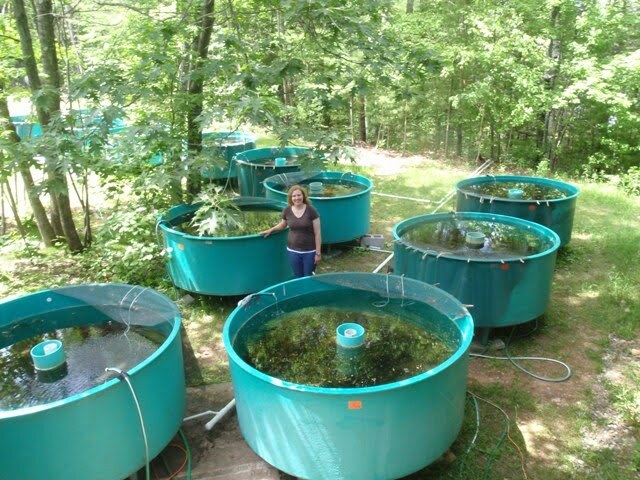 I used a large mesocosm experiment to test the combined effects of predators and parasites on rusty crayfish impacts. When predators were present, infected crayfish were more active than uninfected crayfish and reduced the abundance of macrophytes and macroinvertebrates to a greater extent (Reisinger and Lodge 2016, Ecology).For my postdoctoral research, I am examining the distribution of trematodes in multiple species of crayfish across Midwestern rivers and lakes, including the Great Lakes. I am genotyping these trematodes in collaboration with Andrew Mahon at Central Michigan University. Because Microphallus parasites have different behavioral effects on different crayfish species, I am interested in which crayfish share a long coevolutionary history with these parasites and which are novel hosts. Preliminary results suggests that rusty crayfish are a novel host for this species of Microphallus because it is not present in the native range of rusty crayfish. Macrophytes remaining in a mesocosm after 4 weeks of rusty crayfish impacts. We initially planted 70 shoots. For my postdoctoral research, I am examining the distribution of trematodes in multiple species of crayfish across Midwestern rivers and lakes, including the Great Lakes. I am genotyping these trematodes in collaboration with Andrew Mahon at Central Michigan University. I am also collaborating with colleagues at Central Michigan University (Donald Uzarski, Kevin Pangle, Deric Learman, and Daelyn Woolnough) to investigate connectivity between coastal and offshore habitats in northern Lake Michigan since the invasions of dreissenid mussels. The shallow nearshore environment in large lakes is important for ecological communities and economic services; however, communities and ecosystem processes in shallow areas of large lakes have been understudied compared to those offshore. Connectivity between nearshore and offshore ecosystems fluctuates with changing water currents, and exchange of nutrients and organisms between these habitats has the potential to influence biological communities in each of them. We are sampling physical parameters, nutrients, phytoplankton, zooplankton, benthic macroinvertebrates and fish in the coastal and nearshore environment of Lake Michigan with high temporal frequency to gain a better understanding of these processes. Undergraduate students are involved in this research project each summer through Central Michigan University’s summer undergraduate research program.